Of all the tours currently offered at Walt Disney World, none seems to be of questionable value more so than the seasonal Holiday D-Lights. The Holiday D-Lights tour allows guests age 16 and older the unique opportunity to see Walt Disney World’s three major holiday events across three parks in one night: Cinderella Castle Lighting at Magic Kingdom, Osborne Lights at Hollywood Studios, and the Candlelight Processional at Epcot. In addition, Disney adds in food and visit backstage to create a whirlwind night of holiday magic. Holiday D-Lights is the most exclusive standard tour offered at Walt Disney World. Available only 9 nights in 2011, there were only 360 guest spaces available on this seasonal tour. Since Holiday D-Lights was only offered Monday-Wednesday for the three weeks after Thanksgiving, there weren’t many narrators to choose from. I ended up settling on a “Who’s That” as most of the big names are reserved for weekends. Disney released an updated celebrity narrator schedule in November. As soon as I noticed my beloved Neil Patrick Harris was performing on a Monday, I called and rescheduled my tour date. (Most Disney tours can be canceled or rescheduled up to two days in advance.) Given the limited number of tour nights, I was surprised there was still availability. Like all the Disney Institute-lead tours, Holiday D-Lights guests check in outside of Epcot in front of Guest Relations to the far right of the turnstiles. By the time I arrived at 3:45pm for the 4pm tour, the rest of the group had already shown their IDs and received their name tags and wristbands. It is important that everyone in your party brings a government-issued photo ID to check in for the tour. After one last call for folks to use the restrooms, all 40 of us (a full tour) plus our two guides headed off to board a Disney Cruise Line bus that would serve as our chariot for the evening. The food at Whispering Canyon was delicious as always, and I was very glad I was prepared to eat a full meal at 4:30pm that day. In previous years, Holiday D-Lights guests had a light buffet later in the tour. The guide said this year’s meal change was due to guest feedback saying that the buffet food wasn’t filling enough. We headed backstage to the Event and Decorating Support warehouse straight after dinner (another schedule change from previous years). This was the first stop where we needed to use the audio headset provided to us earlier. These headsets allowed everyone to hear the guides no matter where we were standing. Event and Decorating Support teams are responsible for the decorations for over 3,400 events a year. Not only do they handle events in Florida, but they are responsible for Disney events world-wide. They do work for corporations as well as individuals who contact Disney wanting to have Disney decorations for their events. Patrick, part of the Event and Decorating Support team, mentioned that their biggest private client is a grandfather who spends $3.5-4 million a year for his family’s Christmas celebration. That’s just for decorations! We didn’t get to walk around very much in the warehouse, but they did have a small photo op set up exclusively for the Holiday D-Lights tour. This is noteworthy since photography backstage is an explicit no-no at Disney. On the way out, Patrick gave us all Disney Parks water bottles. Outside the Magic Kingdom, we had to stop at a security checkpoint where a guard boarded the bus and checked our bags just like they do when you enter through normal guest entrances. We did this before entering each park’s backstage area. After the Castle lighting, we stopped below the 65 foot Town Square Christmas tree. Here the guide gave us a history on the tree as well as some trivia about what it takes to decorate the Magic Kingdom for the holidays. Magic Kingdom’s tree does not go up until after the taping of the Christmas Day parade. 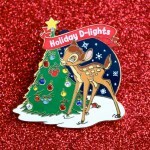 If you take Holiday D-Lights the first week it’s offered, the tree will not be in place yet. As we boarded the bus, we each received a snowman-shaped crisped rice treat for dessert. On our drive over to the Studios, we watched a short video showing the castle lights at 4 of the 5 Disney castles across the globe. Disneyland Tokyo is the only park that does not have castle lights. We headed over to Disney’s Hollywood Studios for The Osborne Family Spectacle of Dancing Lights next. 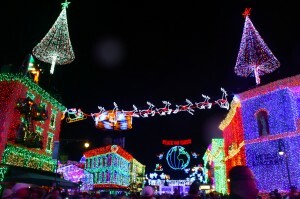 Each year, Disney swathes the Streets of America with millions of Christmas lights that “dance” in time with holiday music. The original lights belonged to Jennings Osborne of Little Rock, Arkansas. Once Jennings was court-ordered to take them down, they found their way to Disney. Nowadays, the original lights have all been replaced with LEDs, but the sheer magnitude of the display remains. This was probably the most informative of the park stops, as the guide spent time explaining the history of the lights and pointing out little details and tributes throughout the display. We even found the famed purple Halloween cat that is hidden in a different place each year. We stayed long enough to see two cycles of the lights dancing (which happens every 5-7 minutes), before we had to be off to make of final stop. While this tour needed to keep to a strict schedule to fit everything into one night, it never really felt that rushed. Backstage at Epcot, we passed by the tent housing all the choir groups getting ready for Candlelight Processional. Each day, there are three shows generating over 800 choir robes that have to be washed and returned for the next night. As indicated in reviews from years past, our Holiday D-Lights Candlelight Processional seating left a lot to be desired. We sat to the far left of the stage pretty far back. Unfortunately, a pole blocked the celebrity narrator. I came to see Neil Patrick Harris, darnit! I was able to scoot around some to take photos, but the pole was definitely a distraction. As far as tour content goes, our seating location is my only gripe about the tour. I see no reason why dining package and standby guests are receiving better seats than the Holiday D-Lights tour participants who paid $199. Our tour dispersed just in time to find a spot to view the 9:30pm Illuminations with the Holiday Tag. A perfect end to (mostly) lovely evening. Overall, I really enjoyed the tour – but at $199 for 5 hours, I can’t help but question its value. The only tour more expensive is Backstage Magic, which is $229 for 7.5 hours. Backstage Magic takes you to 5 backstage locations, and Holiday D-Lights only takes you to Event and Decorating Support. Both tours include a meal at Whispering Canyon and don’t require separate park admission. Unless you’re in town for a short time and want to see all 3 holiday events in one night, you probably already have some form of admission. Even if you’re only in the parks for 2 days, you could feasibly see the Castle Lighting and Osborne Lights in one night and Candlelight Processional on the other. With the money saved skipping the tour, you could even book one of the Candlelight dining packages with reserved seating. 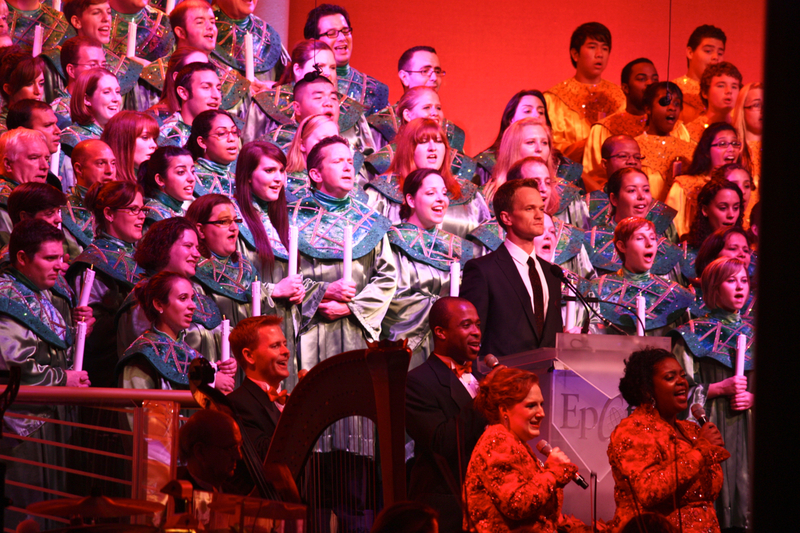 Book early and keep your eye on the Candlelight Processional celebrity narrator schedule for changes. When choosing a date, keep in mind that the Magic Kingdom’s Christmas tree will not be installed until after the taping of the Christmas parade (usually around the first weekend in December). If you have dietary concerns, alert the phone agent when booking. Be prepared for an early dinner (but bring along a snack just in case the tour changes again for 2012). Bring adequate clothing/rain gear depending on the weather. Disney won’t cancel the tour for rain or cold, so be prepared or be miserable. Bad weather can make Candlelight Processional the longest hour of your life. If you’re into photography, bring a telephoto lens for the Candlelight Processional. You’ll need it to get any decent shots of the celebrity narrator from the tour’s seating area. 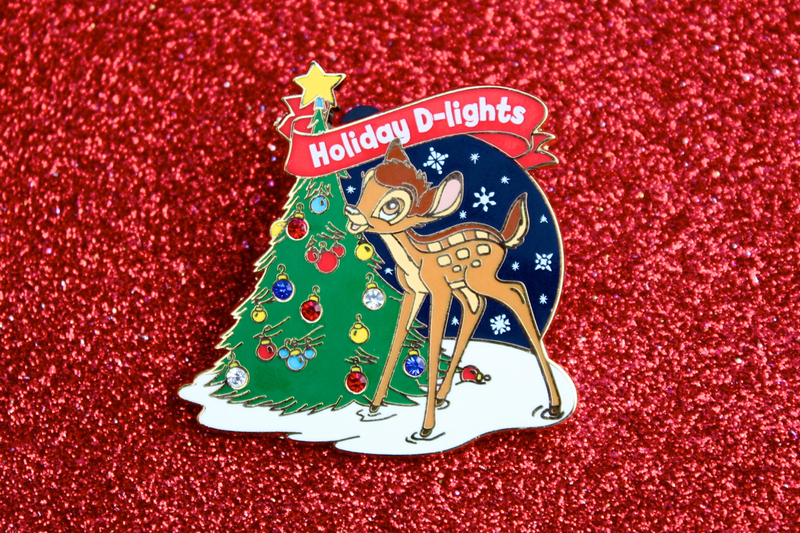 Have you tried the Holiday D-Lights tour? Do you plan on trying it out in 2012? Let us know what you think! This sounds awesome. I am thinking of taking the wife down for our anniversary next December (without the kiddos) and spending some time visiting the hotels to see their Christmas decorations. With the kids, we never make it out of the parks. This would be a great addition to enjoying a relaxing time at Disney without getting into the parks. – Tre8s doux, ce magnifique poirtart (servi par un tre8s beau mode8le). Dommage que le dessous du nez soit un peu crame9, je ne sais pas s\’il y avait moyen de faire autrement. It was a pretty awesome. If you’re interested in other holiday activities, you may also want to think about the Disney Institute’s other seasonal tour, Yuletide Fantasy. I’m finishing up my review of it now, so be sure check back soon. Both tours were really great at getting me into holiday spirit. I’ll be looking for it. We love Disney at Christmas and try to make it there at least every other year the first or second week to avoid the crowds. We’ve noticed the crowds at the Osborne Family Lights are much bigger now than when we first went in 2005. 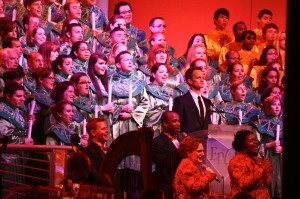 I’ve always wanted to attend the Candlelight Processional. We’ve never gone because I assumed the crowds would always be big. Had no idea that there were times when you could walk up to it and sit down. One year we went and the line to get in was worse than the FP line at Toy Story Midway Mania when DHS has just opened. We have never tried to go back. Definitely gonna put that on my to do list. Went last year with the family and the Castle was very, very cool with the MVMCP fireworks. Ha, I was the only one in my family who liked the sugar cookies they served. The Osborn lights was PACKED elbow to elbow so if you go, you better like crowds. It was one of the coldest times I have ever been in the parks in November. We are from Michigan and so are use to the cold but we had to wear our full winter coats. Burrrr. I had the impression that Osborne and CP were always packed and required long waits to get in. How does this tour rate if you’re considering time vs money? Candlelight Processional is not always packed. It depends on the narrator, day of the week, weather, and whether the park attendance is high (e.g., it’s more crowded on 12/26 than on 12/08). I went in mid-December this year, arrived 45 minutes early, and discovered that I could have walked up a few minutes before show time and sat down. Experiences vary. I have never seen the Osborne Lights uncrowded during park hours. From a value perspective, I do not recommend this tour. 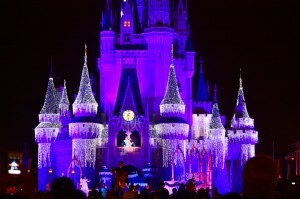 It is fun, but most guests could build in a visit to the Castle Lighting, Candlelight Processional and Osborne Lights into their touring plan. I waited 45 min. to see the Candlelight Processional with Isabella Rossellini on a Friday before I took this tour and had considerably better seating location. If you really only have one night or are not concerned about the price, this tour is certainly worth considering. 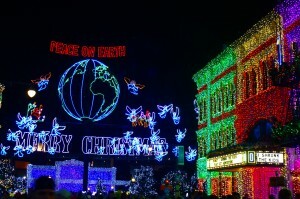 Also, it’s worth noting that we did not see the lighting ceremony for the Osborne Lights. We didn’t arrive at the Studios until almost 7:30, and that night (a mid-December Monday), the crowds at the Osborne were manageable. I could walk freely down the street, but there was no way I could take any photos without a bunch of strangers in the background. Great post Lindsay! I look forward to hearing more about Disney Tours!! !